other to win an unagi dinner. wriggling in the direction of onlookers!) wins the unagi dinner. 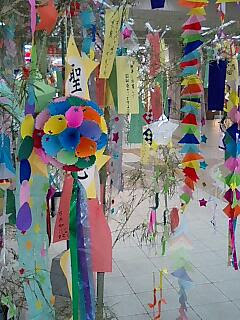 was going on during the Kawamatsuri (River Festival). Can you believe that my town is famous for these things? I mean - as in when you come to Isahaya, you need to eat their trademark dish, unagi. It is usually grilled with a sweet(ish) sauce and served over hot, white rice. It's also popular served as sushi (still grilled). Last week I had some kids over to make ice cream and banana splits. and I think it was also the first time most of them made ice cream, too. and, I daresay, everyone had a good time! Since these guys were novices, we had a short lesson beforehand to go over the important steps in making a delicious banana split. While waiting for the ice cream, the kids also decorated my windows, and so I had a nice surprise waiting for me when the sun came up! I think my Japanese painting teacher is part Italian. It seems that every time I go over to the studio for class, she invariably brings me several treats. Actually, she's not even technically my teacher, her painter son is. 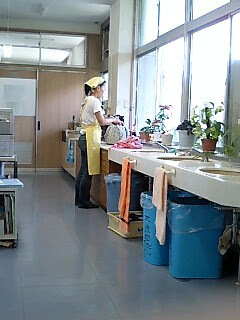 She does the Japanese calligraphy classes. I'm actually a pretty unremarkable painter, but I still like going because it's good to be making some kind of art again in a classroom situation, and taking this class in this setting is "so Japanese". 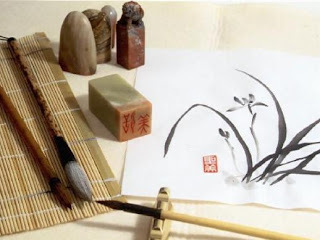 It's called suibokuga (basically ink painting), and I know you've seen examples of it. Very ethereal ink washes of very "Japanese" scenes and objects. When I'm brave enough to show off one of my paintings, I'll put it up. Here's an example I found on the web of a painting and some of the supplies used in suiboku-ga. In the next class my teacher is going to show me how to make a name stamp (inkan) so I'll be able to 'sign' my paintings. So I walked into the staff room last week and saw the volleyball coach crouching on a Japanese flag on top of the table....? Turns out he was writing (in Japanese with a brush) some words of encouragement to a former Isahaya High School student who is going to be in this year's Olympics! 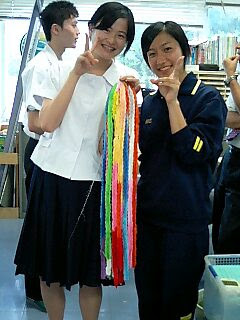 Many other people signed the flag, and the school had a big ceremony to present this alumnus with the flag and this "senbatsuru" (1000 cranes) made by the students. Some of you may know that the making of 1,000 paper origami cranes is a kind of good luck charm. Unfortunately, I had a business trip and couldn't go to the ceremony (and so I'm fuzzy on the details of all of this). I even heard about this athlete at my Japanese brush painting class, since this guy was from that little neighborhood, and while I was having class, many of the neighbors were having an enkai (dinner party) in his honor. 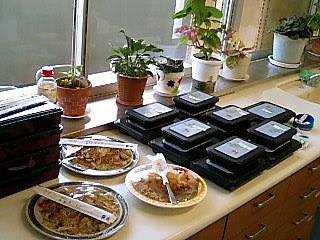 Here's what the bento boxes and plates look like when they're delivered...notice the labels on the forks and chopsticks - teacher's names. Just thought I'd show you what you can get for lunch around here. 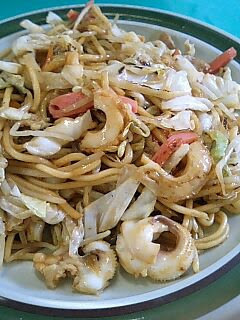 This is yakisoba. (yaki=fried soba=noodles) Interestingly enough, even though soba is in the name, the noodles used to make this dish are more like ramen noodles - made from wheat flour. Other things in the dish include cabbage, bean sprouts, and different kinds of 'meat' - in this case kamaboko (steamed fish paste - much better tasting than it sounds!) and tako (octopus). Here's one of the ladies - she brings the plates wrapped in a big cloth so they're easy to carry. 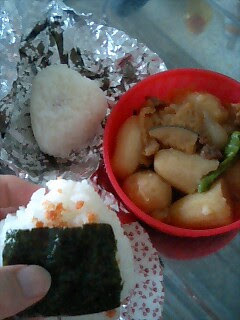 Most people who bring their bento (lunch box) wrap it up in a cloth, too. I think it's called furoshiki. This is the side of the teacher's room - notice the sinks for easy access to wash your hands or brush your teeth. :) Sorry, Cara, still haven't been stealthy enough to catch one of them brushing their teeth yet! You can also see the blue trash bins there - they're for recycling cans, bottles, unburnable trash, and the foam lunch boxes from the only restaurant that doesn't deliver their meals in bento boxes or plates. 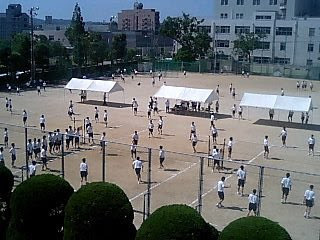 As you know, my kids at school here are always CRAzY busy with classes, extra classes, tons of homework, coming to school on Saturdays and during their 'vacations'...BUT yesterday and today they've been able to let loose a little at the "Class Match" sports competitions. 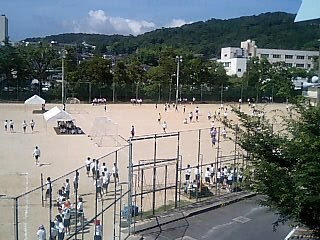 I took these photos from the top of the gym as I looked down on the school grounds at the volleyball and soccer matches. Each class has teams for volleyball, soccer, badminton, basketball, & dodgeball. As I sit up here in the air conditioned haven of the teacher's room, I can hear their continuous cheers of encouragement, and intermittent frenetic coaxing to help their team get that extra push they need at that moment. Have I mentioned that I adore my students here? Days like today it's so refreshing to see the pure joy and determination in what they're doing. 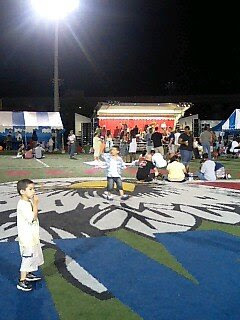 Last Sunday evening I did, however, manage to get up to the 4th of July party sponsored by the base up in Sasebo. It still was a little strange walking into a place with so many Americans all around, but it was nice to be surrounded by familiar sights, sounds, and smells. I ran into some nice people, but mainly kept to myself, enjoying my REAL cheeseburger (can't remember the last time I had one), and the slightly less than cheesy cover bands. Actually the bands were alright, I'm just not such a raving fan of the original bands. But live music is live music. :) I stuck around for the beginning of the fireworks, and saw the last of the show as I rode my little bike back to the train station. And I think I've been here too long, now - that Lou Greenwood song they did to start the fireworks show was almost tolerable :) At least the words sounded different to me this time. but in this situation, I have no other choice. Mold is EVIL. It must die! NO bugs, and, (okay - two great things) - no mould/mildew. it's annoying, but I know it is necessary to make the rice grow, etc. MOLD and BUGS, such evil entities? (remember - below my tatami mats are thin wooden boards, 3 feet of air, and wet soil), I'm under heavy attack. At least the mukade (centipedes?) haven't decided my house was party central. If that happens, it might really get ugly. For now, however, I'll just keep emptying my dehumidifier every 5 minutes and keep wiping down my floors everyday to prevent the kabi from turning my tatami mats into AstroTurf. I'm also keeping a baseball bat close at hand for any gokiburi (roaches) daring enough to cross the threshold. So watch out - I'm armed and dangerous, yo. (or for those of you having trouble reading that - "Ryutousen" (ryou-toe-sen). 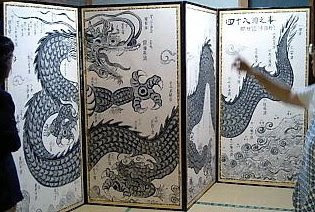 "ryutou" = dragon head, "sen" = springs. 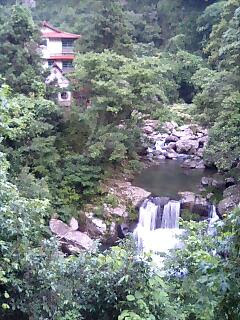 Here's a picture of one of the "taki" (waterfall) and "sen" near the restaurant. The surrounding area was gorgeous - good for hiking and camping I hear. So here's the rest of the story (and the dragon!). As I said in the previous post, this screen was in the restaurant, and it's basically a map of a series of waterfalls in the area. If you click on the picture, you can see the Japanese numbers beginning at the tail and ending at the head. I think the restaurant was up by one of the claws.